A leader mother shares her knowledge about water, sanitation, and hygiene. Living in a rural village in Niger is no easy feat. The sweltering heat, ever-present dust, difficult growing conditions, and more turn it into a daily battle. Villages are frequently both remote and scattered across a terrain that is physically hard to traverse, often leaving them on their own in this fight. But arguably the biggest challenge faced by these villagers is misinformation. Diseases, perpetuated through poor health practices, continue to have a devastating impact on children and the wellbeing of villagers as a whole. Citing their own mothers as their source of education when it comes to health and child rearing, young mothers can unknowingly perpetuate the mistakes of those before them. The Samaritan’s Purse water, sanitation, and hygiene team is actively working to combat these issues with education in the place it’s best received, the home front. 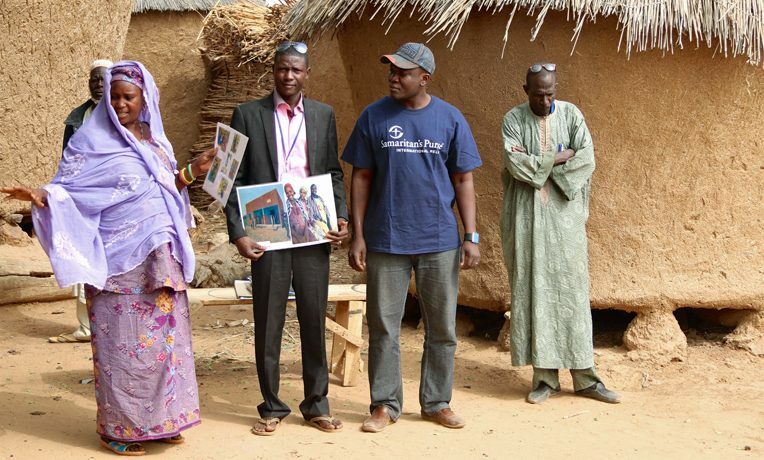 Women from villages across central Niger, trained by Samaritan’s Purse, work in teams called care groups, traveling door-to-door and educating their peers with life-saving information. Training covers a total of 22 water, sanitation, and hygiene; health; and nutrition topics pertinent to rural village living. Through the use of picture diagrams and demonstrations, women are taught methods that help keep easily preventable diseases at bay. Often the result of poor sanitation, typhoid, cholera, and various diarrheal diseases can be virtually eliminated simply by implementing new hygiene practices. 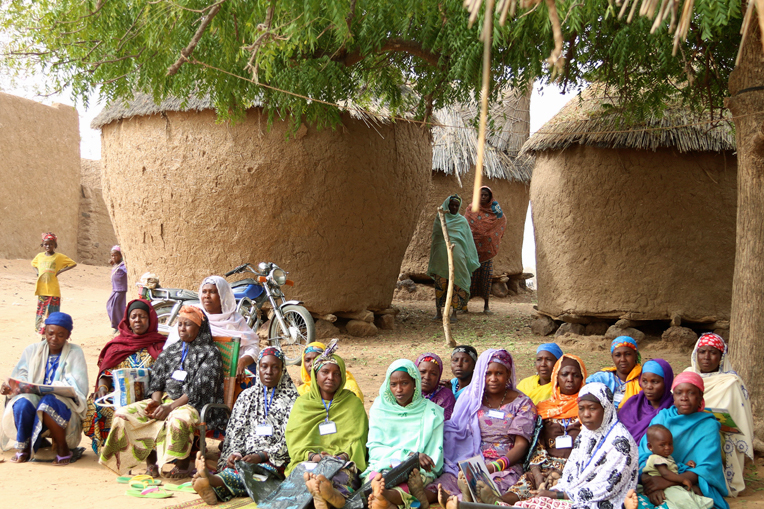 A group of leader mothers in Kuyinaku village. Topics covered include sanitation (such as using soap to wash hands); water treatment, storage, and safe transport; the importance of using health centers and getting immunizations; malaria and diarrhea prevention; and preparation of oral rehydration solutions to treat diarrhea when it does occur. Specific to child care, women are taught the importance of exclusively breastfeeding for the first six months of their child’s life, practicing birth spacing methods (to allow at least two years between children), and adding complementary vitamin-rich foods, such as acacia tree pods, to their babies’ diets. 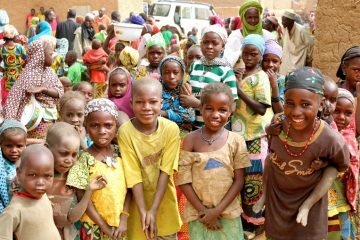 Children in the village of Kuyinaku are direct beneficiaries of the life-saving changes leader mothers have inspired within their village. We are also equipping care group leader mothers with the training needed to sustain their own livelihoods. Supplemental training covers small business management, microfinance, and savings. For a small entry fee of roughly 50 cents, women can join communal banks composed of 20 women. Each month, the accumulated funds are opened and used as a loan for one of these women to support her small business interests, such as selling food in the market or baking beignets. At the end of the month, she returns the loan with 10 percent interest, and the process continues for other women within the group. Most important, women also learn about the Gospel in these trainings. In a country that is around 98 percent Muslim, many people have never heard the words of Jesus Christ. For the first time, they are being given an opportunity to truly understand God’s love. Each care group leader mother voluntarily trains 15 other women to implement the same changes in their own families. With 241 leader mothers trained thus far, 3,615 women from villages throughout central Niger are effecting and benefiting from change.